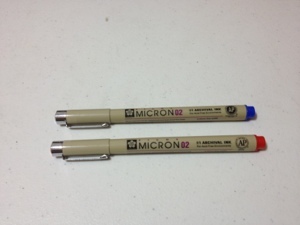 I’ve talked about Microns in the past. They are basically THE technical pen. But those are just the black ones. Are the colors any good? Do they hold up to the standard and more importantly are the colors usable in any real way? How will these red and blue 02s stack up? The bodies are standard Micron bodies. Slick but still grippy. 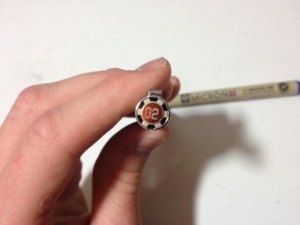 With hard to rub off, easy to read information in convenient places on them and a number on the lid. The color of the base of the pen where the cap clicks in and the ink on the top has been changed to the pen’s color for easy find-ability. The particular pen I’m using here is an 02, so it’s far from both the stiffest and weakest nibs, though it’s closer to the weaker side. It does bend a little while writing. It’s not large enough to provide much variation, either in line weight or color density. The ink is good, standard Pigma ink, archival, stands up to almost anything. 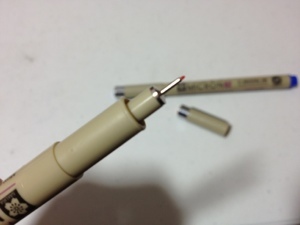 It rarely bleeds and the nib seems to give off just the right amount of ink to have a fast dry time. But on to the color. They are unmistakably blue and red. They are bright and vibrant, even on a fairly off-white paper, such as Moleskine notebooks and the like. It is brighter than any other pen or marker I have used previously. Almost unusably bright, unfortunately, as I can find no drawing scenario where it would be useful. They are good for organization, though, especially on the aforementioned off-white paper where they don’t look so jarring. They can make handy divider writings and are good for color coded text. Overall these are superb pens with little purpose. They work great, are incredibly sturdy and last quite a while, though I can find no way to work them into any drawing. Notes and technical sketches are the best place for these. Or, if you just want to have a nice pen in an interesting color. This entry was posted in Advanced Supplies, Utensils and tagged archival, blue, micron, nice, pen, pigma, premium, red, review, technical pen by Dragon Co (Austin Smith). Bookmark the permalink.